Bart’s Potato Company is an independent, family owned business established originally under the Lamaire family name more than 40 years ago. As the name suggests Bart’s Potato Company specialise in potatoes of all types and for use in all areas of the potato industry. With Bart, the next Lamaire family generation now at the company helm, this passion for potatoes has continued from father to son. Bart Lamaire as his father before him lives and breathes potatoes. 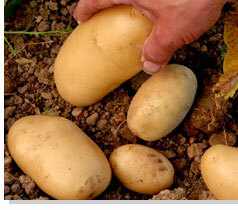 Bart’s Potato Company have diversified and expanded, identifying growth markets and key areas of potential. The business not only grows and markets potatoes these days but can offer a range of fruit and vegetables to compliment the range of potato services offered. ”We believe out passion and dedication is the key to succes and the service we provide is the difference between us and our competitors. "